Now that our society has fallen apart further, the 1980s like simple and honest like the 1950s did to people exhausted of modern society in the 1980s. A better outlook might be that however our fallen time, it is a more fallen version of the 1980s, with the same pitfalls and failures. Those who lived through it can tell you how much a time of terror it was, with nuclear warfare and social collapse at every turn, and how this propelled some artists to put their most sacred hopes and fears into music. Excel was not one of them. 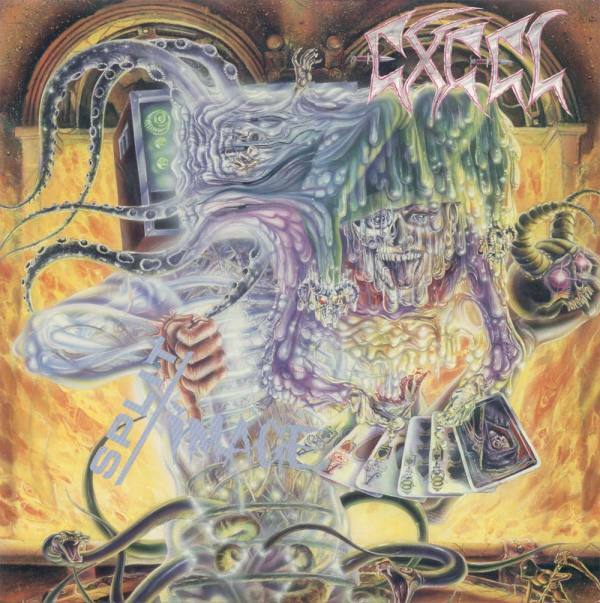 Excel created this “crossover thrash” back in the 1980s but really, this album belongs in with the Pantera/Biohazard school of bouncy hard rock in punk form with some added metal riffs. The problem with hard rock is that it relies on a simple mentality behind its riffs and that it aims to attract, so it is the equivalent of carnival music or a dinner theater side-show, which is really obvious music that gratifies really basic desires. That keeps the interest less than something articulated and involved like DRI, which offers its own riff style that obviously derives influence from many places, but does not parrot them. The only hidden influence here would be a more pronounced version of the Orange County surf-rock sound that incorporates novelty and party music into basic rock and projects it onto whatever genre can serve as canvas, in this case the basic punk of Excel. The tendency toward riffs based on playing a consistent trope, then interrupting it so the audience can get excited for it to return, while a technique to some degree in most music here becomes a staple in the most basic, drunk football fan throwing feces at the stage way. The “crossover” part here consists of faster punk riffs that pick up after the chunky bounce-metal riffs and grandstanding hard rock riffs run out. Over this, a vocalist essentially speaks his lines and ends them on a melodic uptake, and although he deserves some note for periodically sounding like Snake from Voivod, these vocals bring out nothing in the music and mostly try to draw attention to themselves with the rest of the music as background atmosphere. Drums sound like a jogger trying to keep up with the vocals and far too often fall into the same syncopated beat that adds nothing but background noise, since the guitar and vocal hooks are nearly in unison and provide all the rhythm we need. While from a distance this album will appear to be no different than DRI, Cryptic Slaughter and Suicidal Tendencies, it lacks the fundamental spirit toward the expression itself as something distinct from and not pandering to the crowd. There is too much pander in Excel, and it dumbs down the music. Away is Voivod’s drummer; I think you are thinking of Snake.